Chinchillas are herbivores. They have sensitive stomachs and need a very specific diet in order to remain healthy. They are also coprophages, and that means they eat their own feces. 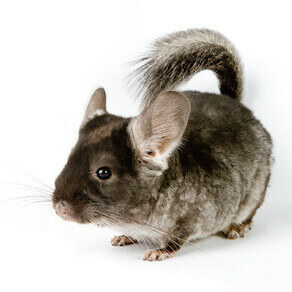 Chinchillas produce two types of pellets: hard dry pellets and soft moist pellets. The latter is a vital part of their diet. Hay should make up most of the chinchilla’s diet. It provides the chinchilla with roughage, and it can give him something to gnaw. Since chinchillas are rodents, their teeth grow constantly. The best types of hay for a chinchilla include common prairie grass, timothy, orchard grass, blue grass, alfalfa and alpine grass. Any type of grass, like good alfalfa, that contains 14 to 16 percent protein, will give the chinchilla something to gnaw, and that will keep their teeth healthy. Chinchillas should be given one or two tablespoons of pellets every day. Chinchilla pellets are grass-based, and they contain the right amounts of proteins, roughage and fat to keep the chinchilla healthy. Pellets made for other animals like rabbits or guinea pigs should not be given to a chinchilla, for they can make the chinchilla sick. Chinchillas should always have access to water. Vitamin C supplements can be added to the water. 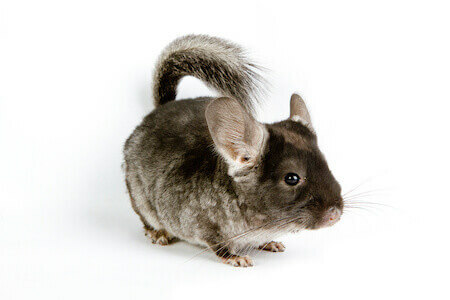 Salt blocks and wheels can also provide a chinchilla with minerals that might be lacking in his diet. Chinchillas love treats, but they should be given sparingly. While chinchillas enjoy dried fruit, nuts and seeds, these things are all fattening. Chinchillas particularly enjoy dried fruit like peaches, cranberries, bananas, and apples, and they also love sunflower seeds and unsalted nuts. They will also happily devour treats sold at pet stores. Less fattening treats include leafy greens and root vegetables like carrots. Chinchillas may be given one teaspoon of the healthier treats every day. Herbs like dandelion or parsley can be given to a chinchilla several times a week in small amounts. Dried rose hips are a very healthy treat with lots of fiber and Vitamin C. A chinchilla can be given one or two rosehips every day. Raisins are a chinchilla’s favorite treat – but they have a lot of sugar. Some people use raisins as rewards to train a chinchilla. People who do this cut the raisin into small pieces beforehand, so they don’t give the chinchilla too many raisins during a training session. While chinchillas love raisins, they should only be given them once or twice a week. Hay should be put in the hay rack in the chinchilla’s cage. The hay should be dry and fresh-smelling with no trace of mold. The chinchilla should be given fresh hay every day. The chinchilla’s pellets should be put in a food bowl, and they should be given fresh pellets every day. Changing the brand of pellets should be done slowly and carefully, for suddenly switching brands can make the chinchilla sick. The chinchilla should gradually be given increasing amounts of the new brand and decreasing amounts of the old brand. It should take a week to complete the switch. Treats should be given by hand and never placed in the food bowl. As they are selective and fussy eaters, chinchillas will pick out the treats – and ignore the rest of the food in the hopes of more treats. This can eventually lead to malnutrition. Treats should not be given to chinchillas that are under six months old. Nor should they be given to sick chinchillas. Water should be fresh or boiled, and filtered, distilled water is even better. It should be given in a stoppered bottle in the chinchilla’s cage. Water should never be put in a bowl, for the chinchilla might tip it over or get contaminants like bedding in it. Chinchillas should be given fresh water every day, and their water bottle should be cleaned every other day to keep it free from bacteria. Chinchillas are strictly vegetarian and should therefore not be given anything with animal ingredients. Dairy products like milk or yogurt will have severe effects on a chinchilla’s digestive tract and can even kill the chinchilla. Acidic fruits like tomatoes or grapefruit should not be given to a chinchilla. Their digestive systems can’t handle high acidity. Like many other animals, chinchillas can’t eat chocolate. Not only does it have too much sugar and fat, it also harms their nervous and digestive systems. Watery fruits like watermelon can give a chinchilla diarrhea, while some vegetables like corn can give them bloat. The methods used to process and store corn also expose it to mold and fungi, and those can make a chinchilla seriously ill. I love my Chinchillas, I want to know all about them. The do’s and don’ts of what to feed them. And water ,what kind of hay, what kind of stuff to put in the bottom of the cage..and their treats.